We are experts in vehicle transportation, offering vehicle delivery and breakdown recovery services across the UK, from our base in Herefordshire. A fully operational car repair & service centre in Ledbury, Herefordshire offering Bosch Diagnostics & Class 4 MOT testing. MOT testing for most types of vehicles. From motorbikes, cars, small vans to large vans, commercial vehicles, minibuses & campervans. We are a long established, independent, family run business with a good reputation throughout Ledbury, Herefordshire and the surrounding counties. 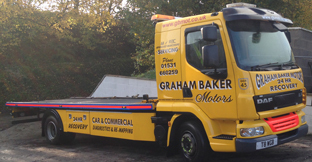 Graham Baker Motors service centre offers customers an extensive range of vehicle services. Based in Herefordshire with years of experience in the motor industry We offer a premium vehicle recovery service. Roadside recovery service 24 hours a day 365 days a year. We have a vast knowledge of all types of motor vehicles so you can rest assured your car or van can be recovered using the fastest and safest methods available. At Graham Baker Motors we use the latest in diagnostic equipment to enable us to service & repair both new & used vehicles from cars to light commercial vehicles. Wrong Fuel...? Right Solution...! We come to you to save you time and money on needless recovery costs. Fully licensed, insured and regulated throughout Herefordshire, Worcestershire and Gloucestershire. We provide an honest & fair service with clear pricing. Carryout repairs/service as agreed with you by staff who are well trained & keen to do the repair properly. We are patch contractors for Mondial, FMG, RAC & EBS contractors for the AA. A leading recovery company in Herefordshire with police contractors for both West Mercia & Gloucestershire constabulary. Contracts with Interpartner, Care, Fleet Support & First Call GB.